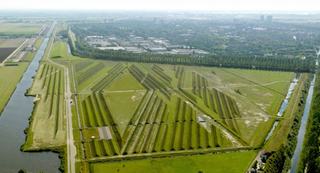 Two years ago in the Netherlands, artist Paul de Kort designed an 81-acre park near Amsterdam’s Schiphol Airport. His assignment? To use nothing but landscaping to dampen the noise of airplanes. Such a project had never been attempted—and a crucial element of the design was discovered almost by accident. I live about 15 miles from one of the busiest airports in America—Chicago O’Hare. Even though I don’t live right under the flight path, I can still hear planes coming in all day. Schiphol is roughly the same size as O’Hare, with 55 million visitors to O’Hare’s 70 million, and it, too, is near a major city—Amsterdam. It seemed unbelievable that mere parkland could reduce all that noise. And yet, as Smithsonian’s Heather Hansman reported last month, the project was a success, cutting airport noise by almost half of what the community around the airport required. De Kort collaborated with an architecture firm called H+N+S Landscapearchitects, and scientists who had been studying the noise problem for years, to create a landscape that would dampen some of the noise of Schiphol. And they did it by using some very old-school landscape engineering. De Kort creates land art, a term that’s only been around for a few decades. When it emerged in the 1960s, land art was a reaction to the strictures of the conventional art world. Instead, artists went out into nature and made things—things that might disappear in a few days, and might be seen by no audience at all. De Kort’s work skews towards more practical—he works often with infrastructure, which in the Netherlands, often involves water. “My work as a [landscape] artist has to do with all kinds of situations in the public field,” de Kort told me. “These are projects I’m asked more often, but these are typical Dutch problems and stir less international attention.” Still, one of de Kort’s projects has made him internationally famous—as the designer of a land art park surrounding Schiphol Airport, outside of Amsterdam. In the late 2000s, Schiphol Airport administrators were looking for a way to deal with the noise that people near the airport frequently complained about. De Kort got involved after meeting the architects on the project, along with acoustic scientists from the Netherlands Organization for Applied Scientific Research, who had been studying ways to mitigate the roar of jets overhead. The repetitive ridges created by farmers worked wonders to dampen the low-frequency sound waves bouncing around the surface—and they gave de Kort an idea for how to design a system of permanent ridges across the park. De Kort was thinking of a German scientist (and musician) named Ernst Chladni, who lived in Breslau at the turn of the 18th century. The plowed ridges near Schipol reminded de Kort of Chladni, and he set out to design a piece of land art that would pull inspiration from the 17th century scientist—while carrying out the scientific observation that a large-scale landscape of repetitive burrows could dampen sound significantly. The layout they ended up with is a series of ridges spaced so that the distance between them was roughly equivalent to the wavelength of the airport noise—about 36 feet apart—and there are 150 of them in all, rising about 10 feet from ground level. All told, these simple ridges reduce noise 2 to 3 decibels, according to Works That Work. That was a success given the relatively small size of the park—which has been open for two years. Now de Kort is getting to see it evolve as nature takes root; he took these photos just last month. But as cities grow towards airports, and as airports begin to anchor entire new cities, odds are good that developers may turn to Schiphol for guidance before long. If you look at the world’s fastest growing cities, many of them are being planned around mega-airports, which themselves look more like small cities—with hotels, malls, and entertainment centers—than infrastructure. In rapidly-developing parts of the world, access to air travel is being prioritized, and more people are going to end up living close to the roaringly-loud noise of airports than ever. We’re living in the age of the aerotropolis—but to make airports truly livable, planners may end up looking to a Dutch land artist and an 18th century acoustic scientist for answers. Aerial images by Your Captain Aerial Photography, image editing Paul de Kort; all other images by Paul de Kort.